Bringing up the rear in van Kushings retuine is Kryten the chemdog veteran and his trusty hotshot lasgun. I like him. Only thing I'd offer is if you could perhaps tilt his head up a little so he looks like he's peering ahead in the direction he's running? Half painted already... You've got a point though. Looking cool, can I ask. What's the piping made from? It's a sort of of lead wire I found in a hobbystore. Thanks Jeff. I'll have to scour my local store and online to find some as it seems to fit in perfect for 40k. 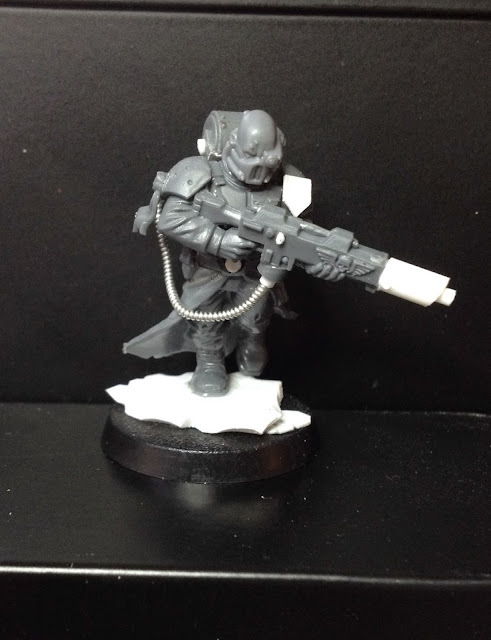 Your blog and Blanchitsu in Visions has been a massive influence and encouragement for me to start my own Inquisitor/henchman conversions. I just need to make the painful transaction of buying a whole box of miniatures for that one skull or shield I've spotted. I need a bits box!! The Blanchitsu articles have certainly influenced me to an enormous extent - it was the best part of the, now old, new whitedwarf! 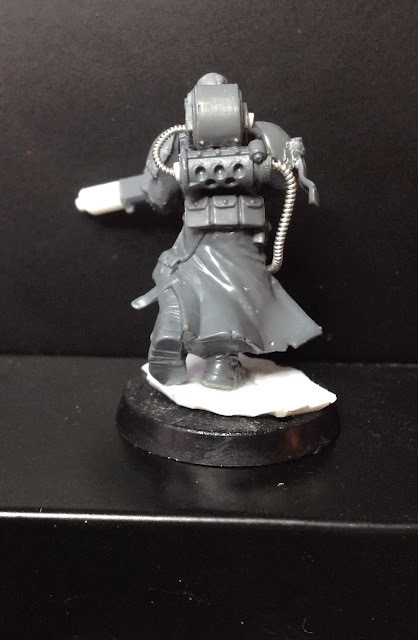 It´s good having a few boxes around - an investment in a box or two of grey knights, flaggelants, scions and a few other kits is certainly worth it if one aims to start making inquisimunda/ing28 model. However for those times you just want that certain special bit I can recommend using bits sites like Bitsandkits. Thanks, that;s a good find, the only site I found which was similar to that was awful to navigate and most of the things were sold out. Def want to get in to ing28. I'm guessing no-ones done a kill team style 7th ed update for it.